As with Bach’s Mass in B Minor, Verdi’s Requiem and Beethoven’s Missa Solemnis, Monteverdi’s Vespro della Beata Vergine (1610) expresses universal theological points by embracing a universe of music. Boston’s Handel and Haydn Society ventured into that universe and took a capacity Jordan Hall along with them Friday night, under the direction of Harry Christophers. 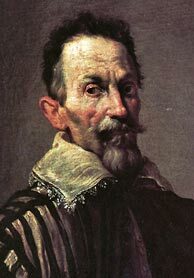 It may seem strange to list the Vespers alongside such monumental sacred pillars by Bach, Beethoven, and Verdi, but in reality, it was the change in musical aesthetics largely ushered in by Monteverdi in this piece that set the stage for such high Baroque, Classical, and Romantic examples that followed. Ironically, this also relegates Monteverdi’s own towering statement to the domain of early music specialists in our own age, lessening its cultural ubiquity but not tarnishing its dramatic or spiritual impact. The epic work spans 90 minutes, setting 13 musical sections in motion through the psalms and motets used in the Catholic Vespers service, part of the Liturgy of the Hours recited in monasteries for centuries, even unto today. Monteverdi consciously juxtaposes the contrapuntal stile antico and monodic stile moderno, moving from 6-, 8-, and even dizzying 10-part polyphonic choruses to solo monodies where the accompaniment is so subservient to the vocal line the result would spawn both the aria and the recitativo. The Vespers is scored for a choir of mixed voices, seven soloists, and an instrumental ensemble (Monteverdi did not indicate specific instrumentation, a practice not at all uncommon at the time, but H + H employed pairs of violins, violas, recorders, cornetti, sackbuts, a bass sackbut, harp, dulcian, and a continuo consisting of cello, bass, organ, and chitarrone). The journey opens with the immortal call to prayer Deus in adjutorium, sung by solo tenor, followed by a response by the whole ensemble sung over the single-chorded fanfare from l’Orfeo. What one heard in the first section would be the recurring positive and negative points throughout the evening (though the former far outweighed the latter). The most vexing was the seeming indecision made, or lack of attention paid, to vibrato or the lack thereof. It often seemed to sneak in, for nearly all the soloists, unbidden but undeterred. In the orchestra, intonation was occasionally an issue, though in the first movement it was forgiven. In the psalms and motets that followed, some of the strengths of the choir and soloists shone through; the choir’s ability to modulate articulation on a dime, so necessary in this style, brought the violence of conquassabit capita in terra multorum so instantly to de torrente in via bibet that one got a sense of causality. Tenor Mark Dobell, who also intoned the beginning, was at home in the Nigra sum, accompanied by harp and chitarrone, and the two soprano soloists Margot Rood and Sonja DuToit Tengblad seamlessly executed their interweaving counterpoint in the Laudate pueri despite being separated by 3 of the male soloists (sometimes the solo voices sang from within the choir). This soprano duet flourished in the Pulchra es, from the Song of Songs; on the text that translates “turn your eyes from me, for they overwhelm me”, what was a solo became a duet, and a triple dance alternated with flutteringly fast and seductively relaxed tempi, like a musical respiration. The men also had their moments to shine: baritone Woodrow Bynum in the Laetatus sum, David McFerrin during the Ave Maris Stella, Dobell and Jeremy Budd while in a transfixing Duo Seraphim-turned-trio, when Jonas Budris joined. Budd and Dobell are Vespers veterans and frequent collaborators with Christophers; perhaps because of this Budris came across overly light and not coequal, a defect of potential theological hazard when the three voices joined to sing about the Trinity. The work has some built-in drama and novel effects which H + H executed well, including an “echo” voice sung from the balcony (possibly inserted by Monteverdi the exploit the antiphonal balconies in San Marco in Venice, where he took the helm shortly after composing the Vespers). The Vocal Arts Program children’s choir singing from the from the balcony, unfortunately was seen and not heard rather. For the most part, though, the soloists were stellar, the choir virtuosic and the orchestra first rate. Christophers totally embodied the complex interchange of tempi and rhythmic modulations. The choral voices sounded best when they were allowed to unleash and explore; unison cut-offs and in particular entrances worked less successfully that one would have liked. Likewise, the orchestra, either through flagging attention or growing fatigue, was having increasing intonation troubles as the end drew near. That said, the main complaint this reviewer had was the decision to have an intermission. The main movements of the “2nd half” – the famous Sonata and antiphonal Audi coelum should have been the apex of the rising tension growing from the start; with the intermission this shape was lost, and neither half had a shape of its own. Like the Bach Mass, Monteverdi’s Vespers can be seen simultaneously as a collection of sections and as a unified single entity. Like Verdi, Monteverdi walked a line between two distinct musical languages, juxtaposing them to highlight their commonalities as much as their differences, And like Beethoven, by using all the musical forces and tools at his disposal (and his skill in developing still new practices) Monteverdi embraced the infinite, and crafted a masterpiece outside of time, for all time.